Well, winter has arrived with a bang! Last night, it went down to 5 F (about 20 below C) with snow flurries all night long. I had to go to the library, and my hands were so cold I couldn’t even sign my name. And yes, I was wearing a coat in the car – and wool gloves. 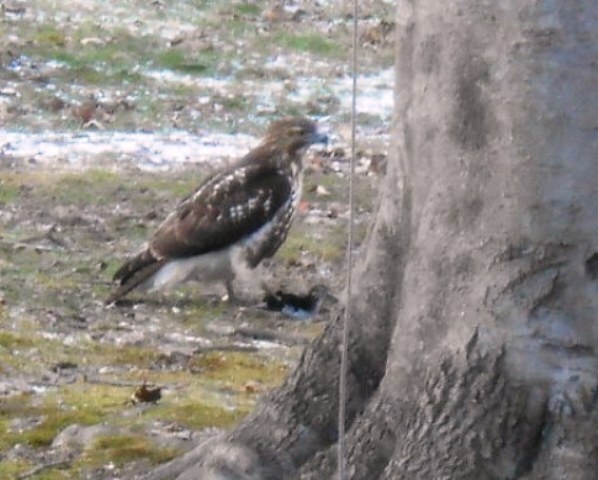 We had a visitor in the back yard this afternoon. This is a young eagle – not sure what kind – eating a mourning dove he(?) had just clipped in mid-air. He certainly looks well fed, at any rate. Our pond is frozen solid on the far end. The pond is fed by the overflow from our well, and runs into the stream below the house, so this side never freezes. I’d be tempted to drag out my skates, but it’s not worth risking my life, or listening to the (well deserved) dressing down I’d get after The Squire pulled me out of the water. It’s 28 F now and supposed to go way down tonight. Brrr.